Your feet carry you a long way, the average adult takes between 4000 to 6000 steps per day and our feet carry use the equivalent of 3 or more times around the earth in an average lifetime. That’s a lot of mileage, no wonder our poor feet develop problems! Corns and calluses are hard, thickened, compacted areas of skin. They develop due to friction and pressure, in areas of the foot that are under repetitive load. Painful corns and calluses often appear on the soles of the feet, over bony prominences and on the toes.Corns are commonly mistaken for verrucas and vice versa. Verrucas have little black dots, which are capillaries, but these are not always visible under overlying callus. Corns and callus are easily treated using specialist chiropody instruments to remove the hardened tissue. This is a painless procedure that brings about immediate symptomatic relief. It is however, often only a short term solution. Corns and calluses are likely to return, unless the cause of the problem is dealt with. There are various solutions that are used to off- load areas of the foot that are under pressure, load and repetitive friction. These methods include the use of specialist insoles, metatarsal padding, toe dividers, gel toe caps and the fitting of molded silicon devices (Otoform) to protect around the contours of the toes. Osteopathic treatment can also help to relieve pressure under the foot. This is because osteopathy is effective at ‘balancing’ the body’s structure towards the centre of gravity. Manipulation to the musculoskeletal system, changes the vector of forces that pass through the spinal curves, the hips and pelvis and to the knees and ankles; this in turn, redistributes pressure between the arches of the feet, which is the foundation of the body. This can help to prevent the development of persistent corns and callus. The medical term for this condition is onychocryptosis.Ingrowing toenails can be extremely painful. In severe cases there is nearly always evidence of swelling around the toe and frequently infection due to a spike of nail piercing the adjacent tissues. Antibiotics are useful when there is risk of developing further complications, such as when the infection starts to spread. However, apart from helping to reduce swelling and infection, antibiotics do not deal with the source of the problem. Ingrowing toenails occur when the edge of the nail involutes or curves round sharply into the nail sulcus. The cure for this problem is to remove the offending object! This can often be achieved using nail nippers to cut down the edge of the nail and remove the nail spike. This is not ideal, since in normal circumstances this can encourage the nail to involute. Surprisingly, this can often be done with minimal pain! However, depending on the severity of the problem, it may require either a partial or total removal of the nail plate. These procedures are known as a partial nail avulsion and a total nail ablation. Local anaesthetic is injected into the toe to dull any pain. This provides a long term solution to the problem because a chemical is placed at the root of the nail in order to stop regrowth. This works in 96 percent of cases. After the procedure the toe is dressed and kept clean. You can still remain mobile afterwards, however the toe needs to be protected and certain activities should be avoided for a couple of weeks. 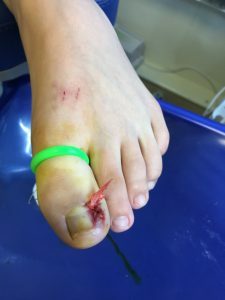 In less severe cases of ingrowing toenails, a toe brace can be fitted to pull the sides of the nail away from the underlying tissue. This can bring about immediate relief and it also helps to straighten the toenail over time as it grows out. If you are suffering from heel pain, you may have found that it started for no apparent reason. This is actually fairly common. It may also cause you to ‘hobble’ out of bed in the morning. Inflammation caused by micro tears in the plantar fascia are normally painful first thing in the morning. The arch of the foot has to take the weight of the body and this force pulls directly onto the heel. There are many other causes of heel pain, such as a heel spur and stress fracture. It is important to get it properly examined by a professional clinician, to ascertain the cause of the problem. 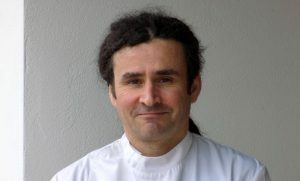 Podiatrists are experts in the diagnosis and treatment of disorders of the foot. I have many years of experience in finding the most effective ways to treat and manage conditions such as plantar fasciitis. They are often quite stubborn and difficult to resolve. Standard advice and treatment usually consists of stretching the calf muscles, using heel pads or arch supports and rolling your foot on a ball. This may bring short term relief but the constant need to weight bear soon irritates the heel, especially when standing after sitting for awhile. Treatments such as Extracorporeal Shock Wave Therapy are effective in bringing about lasting therapeutic changes in patients with heel pain. Osteopathy can help to change the way that loading occurs through the foot. This is important because treatment of the whole skeleton brings about more balance through the arches of the foot, thereby off-loading the painful area of the heel. This is a plantar wart which can be mistaken as a corn. It is caused by a common virus (Human papillomavirus) which is fairly contagious and lives in the ‘host’s skin’. Verrucas can be distinguished from a corn by the presence of tiny little black dots in the skin which are capillaries. Unfortunately they are notoriously difficult to get rid of. However research shows that verrucas tend to run their course and just simply disappear after an average of about four years. This is not the case for everyone and their are some people for whom they seem to persist for much longer. Sometimes verrucas spread and form clusters of warts on the foot. This then inevitably leads to a build up of callus which then becomes painful to walk on. There are many treatments for verrucas, many of which are completely useless. Cryotherapy and salicylic acid are commonly used, however they often require months of regular treatment before they cajole the immune system into action, which ultimately gets rid of the verruca. The good news for verruca suffers is that a new treatment that has become available. This is called SWIFT and it works by zapping the verruca with microwaves.It is far more precise than using cryotherapy, which tends to leave parts of the virus in the tissue due to its limited precision. The organism that causes this unsightly condition thrives in a warm, damp, dark environment…just like mushrooms! It also feeds off of the nail plate causing the yellow, white and dark discolouration, which in turn causes damage, with thickening and brittle nails. This is a stubborn condition to treat and many of the anti fungal topical treatments available from the chemist tend not to have a significant effect. This is partly because they require much perseverance with many months of treatment. One of the main reasons why fungal infections are so difficult to treat is due to the barrier formed by the nail plate. Topical treatments have difficulty penetrating through the nail plate to the nail bed. There are also antifungal drugs that can be taken orally. However, they are fairly toxic to the liver with other side effects and are best avoided. There are far less harmful treatments available, such as ‘Clearanail’ that works by making very small holes in the nail plate. This then allows an antifungal agent to reach through the surface of the nail to destroy the fungal infection. Overtime the nail grows out and the holes disappear along with the diseased nail. Many people find it difficult to reach their feet to comfortably cut their nails, quite apart from the problem of clearly seeing the nails and toes, to avoid the hazards of sharp instruments. I provide a professional nail cutting service and specialize in trimming and thinning thick, long, hard to cut nails. Metatarsalgia is the medical term used to describe pain under the ball of the foot and underneath the front of the foot. It often occurs when you have been on your feet all day and feels like a burning, deep ache in the bones of the foot. It can partly be caused by tight, restrictive foot wear but it is also associated with biomechanical issues. This means that the shape of your foot and the way you walk, may predispose to getting this condition. A biomechanical, gait analysis assessment, can reveal what the underlying problem is and treatment using custom made orthotic (insoles), would provide padding under the foot to off- load the painful areas. Fat pad atrophy occurs under the front of the foot, under the metatarsal joints. There is a natural pad that can loose its ability to shock absorb. This occurs over time and is often caused by wearing high heels and is also associated with foot deformities such as bunions and hammer toes. When the fat pad looses its ability to shock absorb, the metatarsal bones become more exposed and areas of hard skin build up and corns develop under the joints. This can be very painful and will frequently cause a person to limp. It is important to consult a podiatrist to have this problem assessed and treated before further damage occurs under the front of the foot. The correct term for this condition is known as Hallux Valgus. This term describes the angle between the 1st metatarsal and the big toe. A bunion is an increased angle between these two bones. The prominent tissue on the inside of 1st metatarsal phalangeal joint can end up rubbing on the inside of shoes, which can cause a swelling or corns and callus to form. The joint can also enlarge due to arthritis, which then causes stiffening, making walking painful. 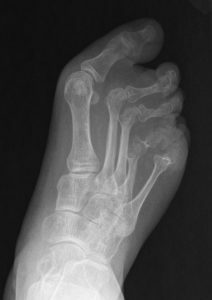 Another problem can occur when the deformity starts to affect the other toes and impinges on the 2nd toe, causing ‘crowding’ of the 3rd and 4th digits. Bunions are primarily a problem caused by a muscle imbalance of the intrinsic muscles that move the toes. If the problem is treated earlier enough, using specific exercises and manual therapy (manipulation), then it can be adjusted to a more neutral position. Other treatment modalities include the use of bunion splints, bunion guards, toe separators and special insoles. However, these only offer symptomatic relief. Bunion surgery has about an 85 percent success rate but there is no guarantee that the toe will be completely straight or that there won’t be some sort of complication resulting in extended recovery times. Of course ‘success’ is to some extent a subjective thing, especially in relation to aesthetics. These toe deformities often lead to corns that form on top or on the ends of the toes. The corns are caused by friction, from the toes rubbing on the inside of shoes. This problem is easily sorted out by removing the corns with chiropody instruments and preventing the rubbing either by using a protective toe tube or by off – loading the apex of the toe with a toe prop. Surgical correction of toe deformities can be done in severe cases. The joints of the feet are susceptible to osteoarthritic changes partly because of the wear and tear that the feet go through on a daily basis. But of course this is also true of the other weight bearing joints of the lower limb, such as the knees. Apparently in the average human lifetime we walk the equivalent of three times round the planet! That’s a lot of mileage! There are ways to counteract problems associated with arthritis in the joints of the foot. Firstly, a thorough biomechanical examination can help to identify certain factors that might predispose to greater wear and tear in the joints. That could be some sort of gait dysfunction or perhaps a problem with the arches of the foot, such as a fallen arch. These kind of mechanical issues are very often due to misalignment throughout the musculoskeletal system, in the spine and pelvis. Manual therapy applied to the joints of the foot and ankle can be effective at releasing restrictions in movement of the joints of the feet. This can be done using direct manipulative techniques known as high velocity low amplitude thrust; or mobilisation and articulation can be used to move the joints through a range of movement, to help restore normal range of motion. This condition is classified as another autoimmune disease. It can have devastating effects on the joints of the extremities, including the feet. Joint deformities in the feet are common as a result of the immune system attacking the cartilage and laying down waste products in the joint capsules. Surrounding soft tissue structure become inflamed making it very painful to walk on the metatarsal joints. In some cases this can lead to fat pad atrophy and plantar ulceration. Custom made insoles with metatarsal pads can help to off load the front of the foot, bringing symptomatic relief. Biomechanics is a part of podiatric assessment and diagnosis that looks at the posture of the foot and the analysis of gait. The arches of the foot are examined and the position of the joints of the foot and ankle are assessed in relationship to the alignment of the whole skeleton. The feet are the foundation of the body and have a global effect on other parts of the body, including the lower back and knees. Orthotics are specialist insoles that are either prefabricated or custom made devices. An impression of the foot can be captured using foam boxes or casting socks. These molds are then used to build a special insole that is customized to fit perfectly under the sole of the foot. Orthotics are used to help correct biomechanical issues and to treat painful foot conditions , by providing support and padding under the surface of the foot. For example, orthotics can help to treat collapsed arches, heel pain and metatarsalgia. People with diabetes can be at risk of developing complications with their feet as a result of having high blood sugar levels. Hyperglycemia affects the innate healing capacity of the body and can predispose to the development of wounds or ulcers on the feet. Ulceration can then lead to infection, which can spread quickly, leading to serious complications resulting in gangrene and loss of limbs. Circulatory issues are also directly related to the pathological. processes in diabetes and peripheral vascular disease is also partly a consequence of high blood sugar levels, as it damages the arteries and capillaries in the body. 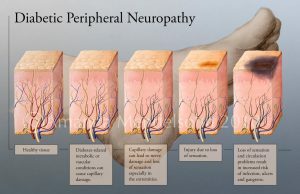 Diabetic neuropathy is also a common problem affecting the feet. This is a term used to describe loss of sensation In the extremities. Numbness in the feet can also predispose to injury, as it decreases the ability to detect pain signals, caused by rubbing and friction on the foot. This is one of the reasons people with diabetes need to have their feet checked regularly to assess for the signs and symptoms of diabetic foot disease. 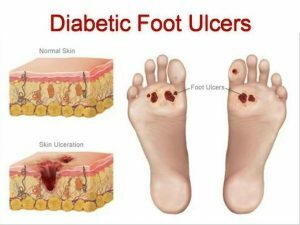 Wounds on the feet, also known as foot ulcers, are associated with diabetic foot disease. Ulcers also frequently occur on the lower legs and ankles, caused by trauma or friction. The skin around this area of the body can become weakened and prone to bruising due to the use of certain medicines, such as walferin and steroids. Ulcers are common in people who have circulatory issues, such as peripheral vascular disease and a history of thrombosis. 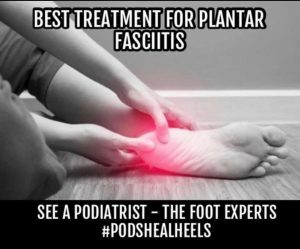 As a podiatrist I am trained to deal with wounds and infections on the feet and can play an important role in helping to clean infected wounds and to help in the healing process.